The Batman Complex Theatrical Trailer. Batman nerd plus movie nerd plus amazingly well-thought-out editing together of disparate clips of unrelated movies = best thing of the day / week. Really nicely done. My attempt at a bottle cap mosaic is here. Patrick Pentland of Sloan on Kurt Cobain and the oddities of sharing a label with Nirvana in the 90’s. He confirms the story that the lyrics to “Penpals” were cobbled together from Nirvana fan letters, but they got them while visiting Sub Pop, not DGC. Sarah recently went through a giant bundle of used valentines that she bought from an estate sale, some dating back to the 1940s. There were all sorts of gems in the stack, but the one below was my favorite. 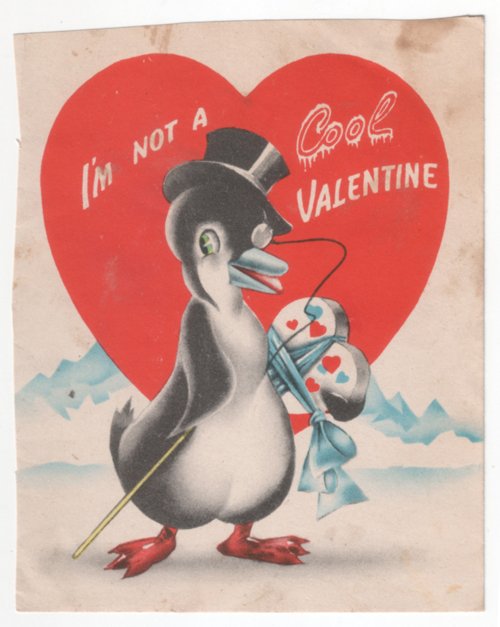 While I’m a fan of the literal, sad-sack interpretation, we did manage to puzzle out a few alternate explanations (ie if the penguin isn’t a “cool valentine,” then he’s a “Hot” valentine, maybe? ).